Join Bandit, a mischievous young raccoon, and his siblings as they embark on grand adventures in the "deep woods" together! 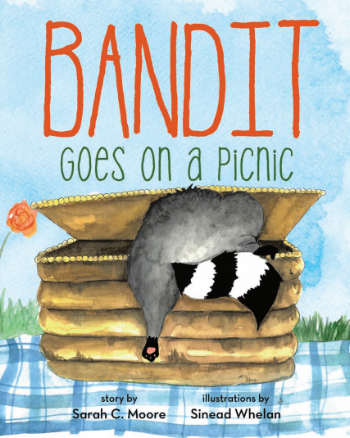 In His first adventure, Bandit stumbles upon a picnic basket in his favorite meadow while he is out playing with Buckwheat and Muffin. Being the curious raccoon that he is, Bandit can't resist seeing what might be inside...but he'd better be careful; curiosity can lead you to some very surprising places! "As a child, I begged my parents to "tell me a story" at bedtime... rather than being read to. I wanted to imagine the characters in a world of my dreams. As a result, Bandit and his adventures were born out of the creativity and love of my father, Mickey, who is no stranger to the deep woods himself! He and I would go on nightly adventures with Bandit and those are memories that I will never forget. I am excited to share The Bandit Stories with you and I hope you will enjoy them as much as I did growing up!"